We value children at St James's. We are also committed to safeguarding children, young people and vulnerable adults to worship and grow in Christ safely. "Children have sometimes been called the ‘church of tomorrow’, but they are key members of the church of today. Jesus called his disciples both to care for children and to learn from them. The sad truth is that there are so many distractions today and the church cannot simply rely on children and parents just turning up because there is nothing better to do. Families have higher expectations of premises and other resources; society rightly has higher safeguarding requirements. Schools are increasingly hesitant about a Christian input. Unless ministry to children, young people and their parents is given a priority, churches will continue to lose younger generations. St James’s has for many years offered ‘Sunday School’-style groups (Shell Seekers) and all-age worship. Last year this was supplemented by our ‘family-friendly’ Together at Eleven weekly service. We are now blessed to employ Karen Roach, an experienced and gifted person, to further strengthen our ministry. We are praying that through her work with our volunteers, many children and their parents will discover and grow in the Christian faith. This is a new post that has been paid for from Betty Stewart’s legacy. As she was someone who worked with children, the PCC felt that part of her gift should be used to provide a richer experience for young people." Revd Derek Winterburn, February 2018 Spire Magazine. St James's Ark runs on Monday mornings in term-time and attracts up to twenty families; as well as free play there is a story / song time. A Children’s Ministry Team co-ordinates the various activities. It has also formalised a recruitment process for volunteers. • A new service, Together at Eleven, was started after Easter in 2017 and is held every Sunday in term time. • The All Age Service happens at particular times in the year, for example Mothering Sunday, Harvest and Christingle. • Occasional special services are held, for example a well attended Pet Service (not just for children). 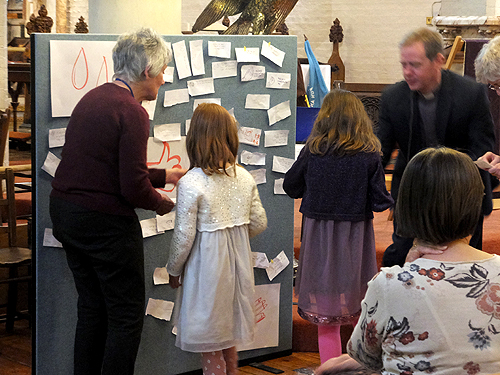 Several children's parties have been held since Revd Derek Winterburn became our tenth vicar. These included a paddling pool tea party in the vicarage garden, a teddy bears picnic, a late summer party, a celebration of light as an alternative to Halloween and an Epiphany party. Shell Seekers Sunday School is a lively, caring group for children aged four upwards, run by a range of adults from the church. Find out more on the page The Shell Seekers Sunday School. If you do then come along and sing in the choir. Find out more on the page Choir. If you can then come along and play in our instrumental group, St James's Players. Find out more on the page St James's Players music group.